A ministry of the Archdiocese of Kansas City in Kansas, we provide programs and services to those in need of all faiths. 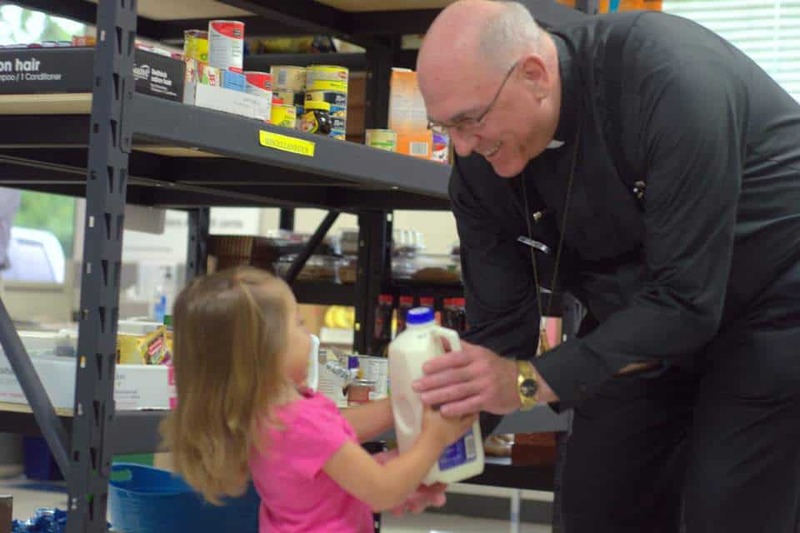 Founded by the Roman Catholic Church to meet the needs of the most vulnerable in our communities, Catholic Charities of Northeast Kansas looks to Sacred Scripture and the traditions and teachings of the Church to guide its mission. Our vision is to help our neighbors who are challenged by poverty of mind, body and spirit find the open door of Catholic Charities in our communities and are met with help, hospitality and hope. As a faith-based organization, we are inspired by God’s love and compassion to provide unconditional love and necessary help to people of all faiths by stabilizing and strengthening individuals and families in need across the 21 counties of Northeast Kansas. 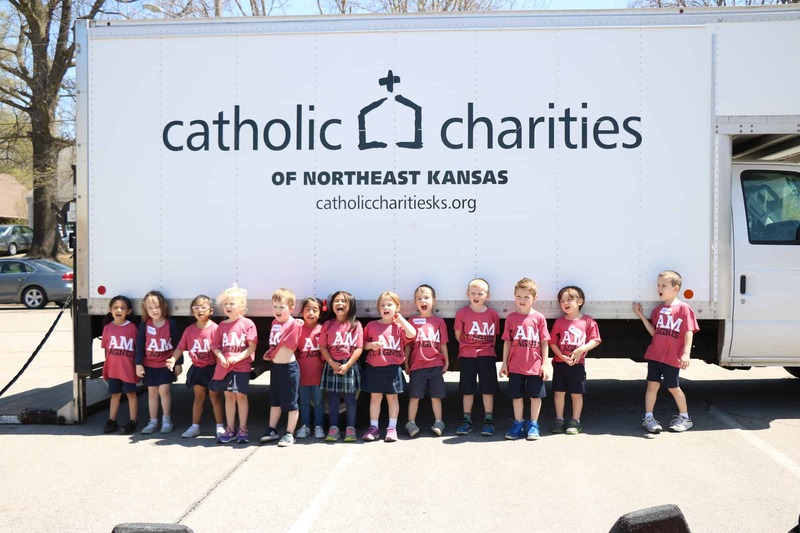 Founded in 1956, Catholic Charities of Northeast Kansas is a ministry of the Archdiocese of Kansas City in Kansas. Our purpose is to animate the Gospel of Jesus Christ by putting love into action through specialized programs and services for those in need. Staff and volunteers embrace the broadest definition of “who is our neighbor,” serving not only the Catholic community but all faiths across 21 counties in Northeast Kansas. Eight Emergency Assistance Centers, eight food pantries and two mobile resource buses assist more than 25,000 times each month, providing food for the hungry, clothing for those in need and shelter for the homeless. Financial literacy and job placement services are available for those who move past the crisis phase and are ready to take the next steps towards self-sufficiency. Catholic Charities also counsels pregnant women facing an unexpected pregnancy; pairs adoptive families with infants in need of a forever home; resettles refugees from Africa, Southeast Asia and the Middle East forced to flee their country due to religious or ethnic persecution; schedules volunteer visits to the elderly to ease loneliness, and in-home support to help seniors live independently as long as it’s safely possible; and enhances the lives of loved ones facing a life-limiting illness, caring for them physically and providing them and their families emotional and spiritual support through the compassionate ministry of Catholic Community Hospice. From the beginning to life’s end, Catholic Charities is there every step of the way dispensing love and hope. 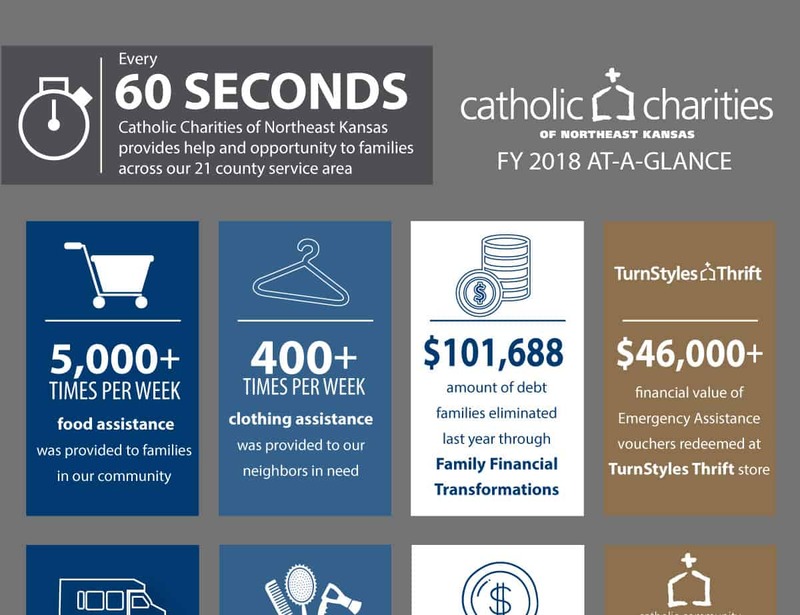 Every 60 seconds Catholic Charities of Northeast Kansas provides help and opportunity to families across our 21 county service area. Throughout the year we have continuously helped our neighbors in need. Food assistance has been provided more than 5,000 time per week. Over 2,500 times we’ve offered housing assistance to our neighbors. All this, and more, could only be possible with the gracious help of over 1,600 volunteers each month.